This entry was posted in College Prep, School News, Teen Powered and tagged AP Tests, SAT, schools, written by teens on May 25, 2012 by Teen Blogger. 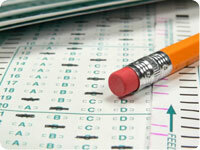 Free SAT Prep Classes at the Library! The Seattle Public Library, in collaboration with Kaplan, will offer a free SAT preparation class from 11 a.m. to 4 p.m. Saturday, Feb. 20 on Level 4, Room 1 of the Central Library, 1000 Fourth Ave. There will be a follow-up session from 11 a.m. to 12:30 p.m. Saturday, Feb. 27 in the Microsoft Auditorium, Level 1 of the Central Library. If you sign up, you must attend both sessions. The classes are presented by Kaplan. Registration is required. Classes are limited to 60 participants who can attend both sessions. Call 206-615-1410 or email teencenter@spl.org to register. Preference given to high school students; middle school students will be admitted if space is available. My SAT date is fast approaching (only about three months now!) and the SAT Prep classes are a great way to feel more confident about the test in general. In the meantime, if you need some SAT Prep books, head to the library to pick up any of these titles. Gruber’s complete SAT guide 2010 / Gary R. Gruber. The SAT word slam : rhyme your way to a better vocabulary and higher SAT and ACT scores / Jodi Fodor. And if you want practice from the actual makers of the test, check out this book from the College Board. The official SAT study guide. This entry was posted in College Prep, Events, Free Stuff, Libraries, Teen Powered and tagged SAT, written by teens on January 26, 2010 by Teen Blogger.